Hungarian philologist; born Oct. 14, 1849, in Budapest. He studied at Raab, Budapest, and Vienna; obtained his diploma as a teacher; and was appointed, in 1874, professor at the gymnasium at Arad. 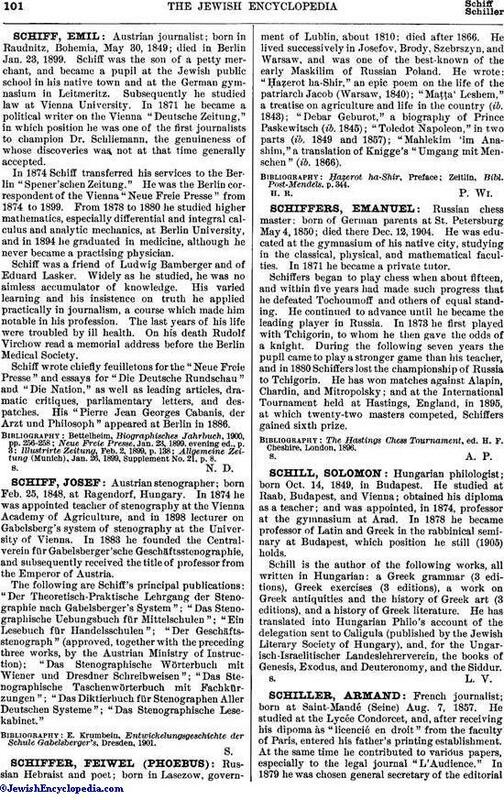 In 1878 he became professor of Latin and Greek in the rabbinical seminary at Budapest, which position he still (1905) holds. Schill is the author of the following works, all written in Hungarian: a Greek grammar (3 editions), Greek exercises (3 editions), a work on Greek antiquities and the history of Greek art (3 editions), and a history of Greek literature. He has translated into Hungarian Philo's account of the delegation sent to Caligula (published by the Jewish Literary Society of Hungary), and, for the Ungarisch-Israelitischer Landeslehrerverein, the books of Genesis, Exodus, and Deuteronomy, and the Siddur.